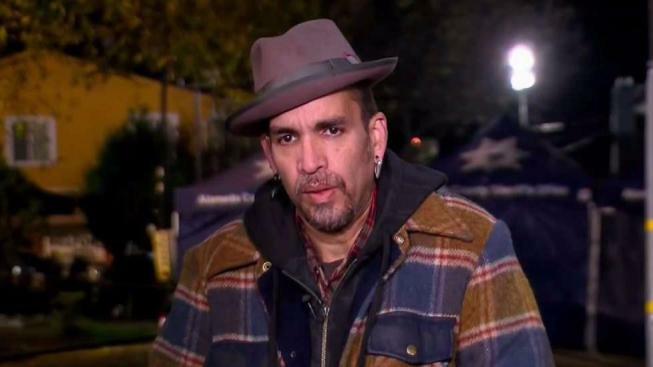 A judge Friday denied a bid by Ghost Ship warehouse master tenant Derick Almena's lawyers to have him released on his own recognizance as he fights the charges against him for his role in the fire that killed 36 people at the Oakland warehouse district in December 2016. Alameda County Superior Court Judge Kevin Murphy's ruling was the second time he has declined to release Derick Almena, 48, from custody in the case in which he and Ghost Ship creative director Max Harris, 28, face 36 counts of involuntary manslaughter in connection with the blaze at the warehouse at 1309 31st Ave. in Oakland's Fruitvale district on Dec. 2, 2016. At a hearing last August Murphy reduced Almena's bail from $1.08 million to $750,000 but declined to release him on his own recognizance. Almena's lawyer Tony Serra asked for a second bail hearing today in the wake of an appellate court ruling earlier this year that said judges must take a defendant's ability to pay into account when bail amounts are set. Serra said, "The amount of $750,000 is not bail for an indigent person such as Derick Almena, it's a pre-conviction punishment." Serra said a defendant's "prospect of getting justice is enhanced" if he's out of custody and is well-dressed and healthy during his trial instead of being in custody, a circumstance that he said tends to make defendants look more haggard and guilty. Serra also said if Almena were released from custody he wouldn't be a flight risk, wouldn't be a danger to society and would be willing to wear an electronic monitor. But prosecutor Autrey James said Almena isn't good at following rules, alleging that the Ghost Ship warehouse was in violation of fire safety codes and didn't have a permit for residential use. James said, "We're here because he (Almena) absolutely would not follow the law." James also said he's concerned by Serra's statement that if Almena is released he would live in Lakeport in Lake County because that's three and a half hours away from Alameda County and he might not make it to court on time and it would be hard for authorities to monitor him there. Murphy agreed that there would be "an issue of feasibility and predictability" if Almena lived in Lakeport during his trial and also said Almena's ties to Alameda County "are very tenuous." Murphy said, "His family is not here, he doesn't have a job here, he doesn't have property here." Taking those factors into consideration, Murphy denied Almena's motion to be released on his own recognizance and kept his bail at $750,000. Murphy also held a bail hearing for Harris today but postponed making a ruling until May 11 to give Harris' attorneys more time to confirm that Harris would have a job and a nearby place to live if he were to be released from jail. Samuel Geller, one of three lawyers who are representing Harris, said Harris displayed his character during the fire by rushing inside and rescuing at least a dozen people. Geller, who said Harris isn't a flight risk or a danger to the community, said, "There would have been a higher body count if it weren't for Max Harris." Almena and Harris face up to 39 years in state prison if they're convicted of the 36 involuntary manslaughter counts. Their trial is scheduled to begin on July 16 and it was announced today that Judge Vernon Nakahara will preside over it. Nakahara was appointed to the Superior Court bench in 1995 and retired at the end of last year but will handle the trial on a special assignment. On May 11, in addition to Harris' bail hearing, Judge Murphy will hold hearings on motions by Almena and Harris to have the charges against them dismissed on various legal grounds.